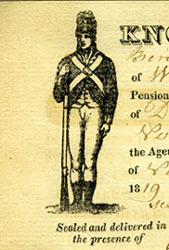 Revolutionary War pension applications may be found in their entirety on Fold3.com at http://www.fold3.com along with many Revolutionary War service records, final payment vouchers for several states, many Revolutionary War rolls, and more. A DAR Patriot INDEX (not the full records) is available at http://services.dar.org/public/dar_research/search/?Tab_ID=1. So far I have documented at least 14 patriot ancestors who fought in the Revolutionary War. Two were at Valley Forge, both my immediate paternal ancestor, Thomas Ogan, who served in the 7th, 11th, and 15th Virginia Continental Line of General Daniel Morgan’s Riflemen, and my immediate maternal ancestor, Israel Hilton Buker who was an Orderly Sergeant in the Massachusetts Continental Line and who was awarded a sword by General Marquis de Lafayette. Others fought in the frontiers of Kentucky and Ohio, at Ticonderoga, in the swamps of North Carolina, and at sea in the Continental Navy. I have found one Loyalist who retreated to Canada and one Scotsman Lt William McFarland who fought for the King in the French and Indian War, stayed in this country, but remained neutral during the Revolutionary War. Except for my father’s mother’s line (1840’s arrivals), all my ancestors were in America by 1725, some 13 generations here in Virginia (1611) and Massachusetts (1620). Mr. Ogan, I sincerely hope you have put you research and results on one of the on-line sites so that your many relatives and other researchers can benefit from your dedication. The Spanish in the along the Gulf also played a very important part during the Revolution under Bernardo de Galvez by providing supplies to the American forces and in the capture of the British Forts at Manchac, Baton Rouge, Natchez, Mobile, and Pensacola. Descendants of the members of the Spanish Army and Navy and militias in Louisiana and St. Louis plus those involved in supplying and driving cattle from Texas to Louisiana also can recognize their ancestors by joining the SAR or the DAR. Although the DAR online Patriot Index is an Index, it provides substantial information about patriots who are listed, including (if applicable) birth and death dates and places, state(s) from which the person served, unit(s), rank, US pension number, residences, name(s) of spouse(s), name(s) of child(ren) on whom applications have been submitted, name(s) of spouse(s) of those children, and names of people who have submitted approved DAR applications or supplementals on the person (names of living DAR members are suppressed). One can also click on links to see the complete pedigree from a DAR member back to a Patriot, and other relationship information. One caveat: in the early years of the DAR, standards of proof weren’t as stringent as they are now, so there is some erroneous information in the database, and earlier applications have fewer sources listed. However, the DAR is working to correct these problems, and recent applications are well-vetted. Also, names may be spelled in ways other than the searcher expects: members of the Pennsylvania Fiscus family are entered under the spelling “Fiskes,” which the family never used, but was used in some official document. However, in this case, and I’m sure in many others where the name has been spelled phonetically, if I search for “Fiscus,” I get a messages telling me to try a search for “Fiskes.” Unfortunately, the DAR doesn’t seem to be open to efforts to correct the spelling of misspelled names once they are in the system. The names aren’t misspelled in the DAR’s database. DAR uses phonetic spellings to standardize the various spellings that can be encountered in this era. When a women is accepted, she can have the Patriot’s name spelled any way she likes on her certificate as well as her Patriot bar on her insignia. Re. Spanish…Other nationalities fought in the American Revolution, as well. At the DAR national conference this summer, I spoke with a French woman who descended from a French soldier who served the the Revolution. Don’t forget to search records at the National Archives. If you don’t subscribe to fold3.com, you can still search the National Archives on location. They have research and records centers in Washington, D.C.; Ohio; Maryland; Colorado; Illinois; Texas; Missouri; Kansas. Google National Archives to find a location near you. The 1840 US Census has a column for “Pensioners for Revolutionary or military services” included in the household. That’s how I discovered the name of one of the members of the Robert Jones household who I later figured out was his mother-in-law. Her Rev. War pension record provided a wealth of details about her husband and his military record, their marriage and family, and where they lived. I don’t seem to find this column on one of my revolutionary soldiers. Was this column on the preprinted forms for the US 1840 Federal Census? The column is on page 2 of the preprinted 1840 census form. I didn’t realize there was a page 2 the first time I found the Robert Jones household. I discovered it later when I clicked on ‘next page’ while browsing the census records for names of others in the neighborhood. Page 2 also includes tallies of slaves, agricultural workers, etc. My husbands (suspected ancestor James Coleman-PA) has a file folder for the Revolutionary war records but it is empty. He was in the militia and paid taxes but disappeared sometime after the 1800 census never to be seen or paid taxes again. Can not find his wife or children. His two brothers are well documented but not James. Was just approved for SAR membership in July. My ancestor, Cpl. William Waller (5x GGF), served from 1776-1779, and re-enlisted in Oct. 1781 for the Yorktown campaign. He witnessed the fall of Ft. Washington, crossed the Delaware, participated in the Battles of Trenton, Princeton, Germantown, Monmouth, was at Brandywine, but was sick with dysentery. Was also at Valley Forge. He was with the Maryland and Virginia Rifle Regiment, but was then attached to the 11th Virginia Regiment, led by Daniel Morgan, who was away at the time taking Burgoyne at Saratoga. Getting ready to trace another 5x GGF, James C. Callaway, who was captured with my uncles, Micajah Callaway and Daniel Boone, at the Blue Licks, Kentucky, by the Shawnee. He was marched to Detroit and sold to the British, and was a prisoner for two years. I was born in Peoria, grew up in Washington, Illinois. My family has lived in the Peoria area for over 150 years. Any advice for possible Loyalist research? So far the sites I have looked at, including the one you mentioned, have not been very helpful. I have limited info, though, so that is also a problem. Female ancestor born in St. John, New Brunswick around 1800 and married and lived in Brooklyn, NY by 1828. No maiden name and not sure if her family came from NY or from Canada.